Fragiel is a cabinet specifically designed to display whatever is precious to you. The ‘floating’ case, indubitably the most distinguishing feature of the cabinet, literally begs you for that miniature David Bowie statue that you bought two years ago but never dared to show anybody. With its slender legs and minimal connections, the frame appears very light and open, but these features also make the cabinet delicate and frail. This is where the cabinet takes its name from; fragiel is Dutch for frail. 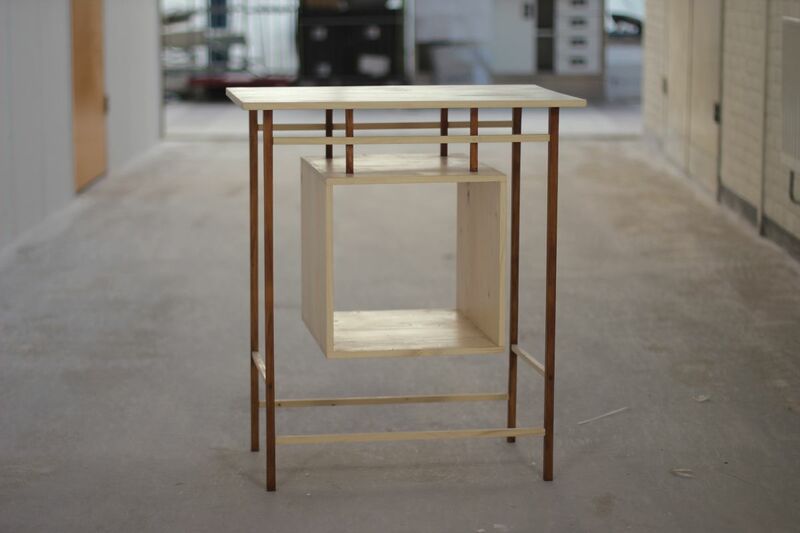 The piece is meant to be fixed to the wall and cannot be used as a stand-alone cabinet. Fragiel is entirely made out of timber boards reclaimed from the logistics industry. Remnants of that rough past – scratches and cracks – are stabilized and preserved in the otherwise delicate and smooth appearance of this piece. The end result is a peculiar combination of coarseness and refinement. The centerpiece case consists of wide Norway spruce boards joined together at each corner using dovetail joints along the entire depth. Each board consists of a number of narrow boards glued together. The cabinet top is created in a similar way. The case hangs on a frame of slender Norway spruce sticks, each of which are connected to one another with wedged through tenons. The ‘hanging’ of the case is achieved using those same joints. This is possible, because the tenon assumes a V-shape once the wedge is inserted and thus gets stuck in the similarly V-shaped mortise. The case can easily carry a variety of objects, like vases, bottles, and books, and has no risk of falling off, unless exceptional force is exerted. The cabinet top is attached to the frame with similar joints. The entire piece is made exclusively by hand. The used Norway spruce boards from the logistics industry were cleaned and planed to get rid of dirt and coarse surface damages, after which they were cut into dimensions with a combination of Western-style and Japanese-style saws to produce the various components of the cabinet. Cutting the dovetail joints along each corner of the floating case was the most demanding and precise stage of the crafting process. The task was done using a fine Dozuki saw and Western-style chisels. These tools were also used to cut the mortises and tenons in the various components of the cabinet. Once the tenons were fitted into the mortises, walnut wedges were inserted to keep the joints in place. All components were sanded smooth, while preserving traces of coarseness as hints to the wood’s origin. The vertical parts of the frame were given a dark stain, whereas its horizontal parts were kept in original hue, like the case and the top. The cabinet was finished using three layers of varnish.